Unsecured dentures, dentures not anchored by implants, are an old-fashioned solution for people who have lost all of their teeth. Unfortunately, you may find that wearing unsecured dentures can be painful, inconvenient and awkward. Such dentures make it difficult to chew a variety of foods, which can stop you from eating many of the foods you once enjoyed. Wearing unsecured dentures may also affect the way you speak and, ultimately, your self confidence. A variety of modern dental implant-based tooth replacement solutions are available. Any of these solutions can dramatically improve your quality of life; such as enabling proper chewing and speaking, increasing comfort and self-confidence, and allows to eat more of the foods you want. Denture implants are especially beneficial because you don’t have to deal with adhesives or clasps. 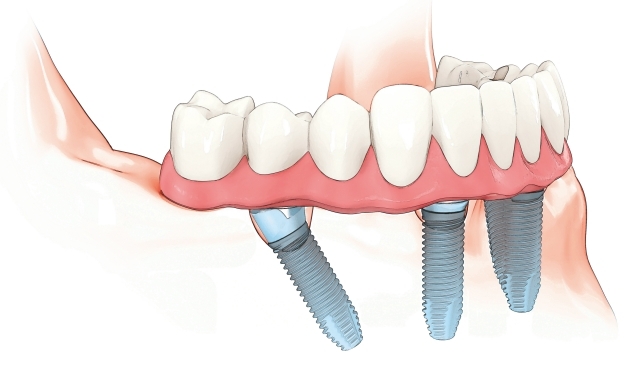 All-on-4 (AO4's) implant secured denture is a denture that is connected to four implants and isn’t removed. Your denture is permanently anchored and is the option that is most like your real teeth. For more information, join us at our next FREE Dental Implant Seminar, sign up here. We ask for your RSVP so we can plan for participation and save you a seat! Dr. Jones and Dr. Caron have had extensive training in dental implants and the wide range of modern solutions available for securing dentures.